Galexia was asked to advise Cambodia on their draft E-Commerce Law during their visit to the country for Workshop W9. This was at the invitation of HE Pan Sorasak - Secretary of State to the Ministry of Commerce. The Secretary was an attendee at AADCP E-Commerce Project workshops (W3 and W5) in his former capacity as an Under-Secretary in the Cambodian Ministry of Posts and Telecommunications. 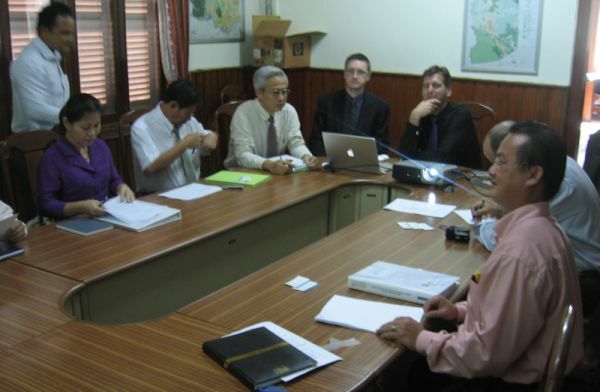 On Thursday 23 August 2007 Galexia travelled to Phnom Penh to meet with the Secretary and the team working on drafting Cambodia’s e-commerce legislation. Galexia held an initial meeting with the Secretary to discuss aid and development in Cambodia and the region more broadly - gaining insights into other work in the region being carried out by the International Telecommunications Union (ITU) and UN Conference on Trade and Development (UNCTAD). Galexia briefed the E-Commerce law meeting on the overall AADCP E-Commerce Legal Infrastructure Harmonisation Project and on the workshop (W9) outcomes in Siem Reap. Galexia also provided specific feedback and advice on the draft Cambodian E-Commerce Law.